http://antydetroidmichigan.blog.onet.pl has been blocked ! ATTOCK: Polish geologist Peter S, kidnapped a fortnight ago from Attock, recorded his statement in the custody of Taliban at an unknown location near the Pakistan-Afghanistan border. In a DVD message sent to Dawn by the Taliban, Mr Stanczak read out a written statement in the English and Polish languages. He appealed to the Pakistani government to accept the demands of Taliban to save his life. Militants in Darra Adamkhel had claimed in early October that a Polish engineer was in their custody. Taliban’s spokesman Mohammad had then told journalists that the engineer had been kidnapped by them and brought from Attock across the Indus to Kohat by boat and then shifted to an unspecified location. You may question why this newspaper received this message? "these so called English news papers are actually funded & bought by foreign investor, they never speak in the favor of pakistan,2 days before operation in barah,dawn publish the news that” Taliban are about to take over Peshawar with main headlines & operation started” how easily they can sabotage peace deal & negociation,how they work for foreign agenda. Country where you have less then 5% people read a understand English, you think they really make business. "no" but they do impact the liberals & decision making people. It can be negative & it can be positive. Only education can save our society from these evil intended institution. " ISLAMABAD, Oct. 2 (Xinhua) -- A spokesman for Pakistan's Taliban on Thursday claimed responsibility for the kidnapping of a Polish engineer in northern Pakistan. The Polish engineer was kidnapped by unidentified militants in Attock district on northern border of Pakistan's Punjab province on Sunday. The militants also shot dead the engineer's guard and two other Pakistani people. The kidnapping took place when the Polish engineer, working for an oil company, was conducting survey at Basal area of Attock district. The police has launched a search operation for the engineer in surrounding areas. Muslim Khan, spokesman for the Taliban in northwestern Pakistan's Swat valley, said the Polish engineer is in their hands, Dawn News TV channel said. But the spokesman did not elaborate on conditions for release of the Polish engineer. Most of the Pakistani Taliban militants are grouped in an umbrella organization, the Tehrik-i-Taliban Pakistan (TTP). The movement was launched on December 13, 2007, in a secret meeting of senior Taliban commanders hailing from the South Waziristan, North Waziristan, Orakzai, Kurram, Khyber, Mohmand, Bajaur and Darra Adamkhel tribal regions and the districts of Swat, Buner, Upper Dir, Lower Dir, Bannu, Lakki Marwat, Tank, Peshawar, Dera Ismail Khan, Mardan and Kohat (The News International [Islamabad], December 15, 2007). According to TTP deputy leader Maulana Faqir Mohammad and other senior commanders, the militants formed the organization to pool the resources and manpower of Pakistan’s Taliban to fight in self-defense if the security forces of Pakistan attacked their areas and also to extend help to the Afghan Taliban taking part in the “jihad,” or holy war, against U.S. and International Security Assistance Force (ISAF) troops in neighboring Afghanistan (Newsline.com.pk [Karachi], July 2008; The News International, July 29, 2007). Due to the military operations undertaken by Pakistan’s armed forces against them, the Pakistani Taliban now have a fight at home and are therefore unable to send many fighters to Afghanistan to fight alongside the Afghan Taliban. The TTP is headed by Baitullah Mahsud, based in South Waziristan and currently the most powerful Pakistani Taliban commander. In his late 30s, Mahsud is referred to as the “Amir Sahib” by his followers. Like many other Pakistanis, he began fighting as a young man during the Afghan jihad against the Soviet occupation force in Afghanistan and later joined the Afghan Taliban. Presently, he is stated to be ill, suffering from kidney and heart diseases due to complications arising from diabetes. He reportedly named three of his commanders to run the TTP on his behalf, including Waliur Rahman who has been negotiating with the tribal jirgas, or councils, created by the Pakistan government (The News International, August 24). Pakistani Taliban have claimed responsibility for kidnapping a Polish engineer, who was kidnapped on Sunday after his two drivers and a security guard were killed during the abduction. Police said that unknown gunmen kidnapped Peter Stanczak after he was ambushed as he and colleagues were traveling to oil plants in their vehicle near the village of Pind Sultani in Attock district, about 110 kilometres from Islamabad. A Taliban spokesman said that they have shifted the Polish engineer to a safe place. He said that Taliban will not free the engineer unless their colleagues arrested in Bajaur, Swat and Darra tribal region are freed. He also warned that the life of Polish engineer will be in danger if arrested militants were not freed. Taliban in Swat have also demanded release of 136 colleagues for the release of two engineers, who were kidnapped a month ago. "We have conveyed our demand to the negotiation team," Taliban spokesman Muslim Khan said. Succes http://antydetroidmichigan.blog.onet.pl has been blocked ! Blog was spreading terrorist propaganda in the Onet blog service. Main sentence was"Iraqi freedom fighteers don't kill civillians"
Dziękujemy za zgłoszenie. Blog łamiący regulamin został zablokowany. Authorities in Poland are also in contact with police, a foreign ministry spokesman said in Warsaw. The company has also set up a crisis team, its marketing director Stanislaw Szabelski told Poland’s PAP news agency. In August, Taliban militants kidnapped two Chinese telecommunication engineers from restive Swat valley in North West Frontier Province. ISLAMABAD, Pakistan - Islamic militants struck back at security forces in Pakistan's northwest while gunmen Sunday abducted a Polish engineer and extended a wave of attacks on foreigners. Officials said armed men in a car ambushed a vehicle carrying a Polish engineer early Sunday morning near the northwestern city of Attock. The assailants killed the three Pakistanis in the vehicle — the driver, a guard and an assistant to the engineer — before kidnapping the Pole, police official Faisal Manzoor said. It was unclear if the kidnappers would seek a ransom or make political demands in return for his release. A computer game in which players battle to wipe out all Muslims is 'deeply offensive' and should be removed from the internet, furious members of an Islamic group say.Muslim Massacre involves taking control of an gung-ho 'American Hero' armed with a machine gun and a rocket launcher. 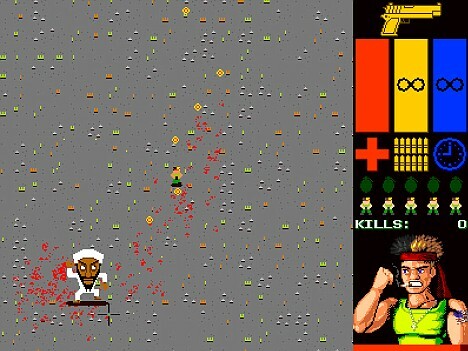 He is parachuted into a Middle Eastern country with the aim of 'leaving no Muslim man or woman alive'.Players progress through the levels, targeting characters dressed as terrorists and civilians, before taking on Osama bin Laden, Mohammed and finally Allah. The group's chief executive, Mohammed Shafiq, said: 'Encouraging children and young people in a game to kill Muslims is unacceptable, tasteless and deeply offensive. 'There is an increase in violence in this country and some of it comes from video games. 'When kids spend six hours a day on violent games they are more likely to go outside and commit violence. 'If it was the other way around, with a game featuring Muslims killing Israelis or Americans, there would be uproar - and rightly so. 'We would urge ISPs to take action against sites like this. 'The games creator, a freelance programmer who uses the name Sigvatr, described his product as 'fun and funny'.There has also been some suggestion that it may be a satire of American foreign policy. Sigvatr, whose real name is Eric Vaughn, was unavailable for comment.But in an internet discussion of Muslim Massacre, he seemed to indicate that the game was not a parody. 'I think it's pretending to be legitimate commentary and I'm sure there will be lots of people who defend it on those grounds, but ultimately it's just a game where you blow the gently caress (slang for a common swear word) out of arabs,' he wrote. Later, he added: 'The Muslims represented in the game aren't meant to be based on actual Muslims. "Another Al-Qaeda online magazine, Muaskar al-Battar (Camp of the Sword), underscored the value of online instruction: “Oh Mujahid brother, in order to join the great training camps you don’t have to travel to other lands. Alone in your home or with a group of your brothers, you too can begin to execute the training program.”11 To enhance cyber security for such connections, the online Technical Mujahid Magazine was begun in late 2006 to instruct its readers about electronic data security and other high-tech matters. During the past few years, the online training curriculum has expanded to include small-unit infantry tactics and intelligence operations such as collecting data, recruiting members of state security services, and setting up phone taps. Readers have downloaded this material in places such as Australia, Canada, Germany, Great Britain, and Morocco, and it has turned up when law enforcement raided cells in those countries. Some intelligence experts argue that online training has its limits—that technical skills and tradecraft require more than Web-based instruction. But although Al-Qaeda’s students might be able to glean only rudimentary knowledge from Internet sources, it is enough to make them dangerous.12"